Plumbing issues are more than a day’s discomfort. With traditional sewer line repair, you’ll have to hire contractors to dig up your yard and wait for weeks on end before the main can be switched on. At Lining & Coating Solutions, we utilize innovative technology to complete sewer line repairs without having to dig a single trench. This makes today’s repairs more convenient, more efficient and budget-friendly. All sewer pipe lining repairs are done above the ground, which minimizes disruption of your daily business operations. It begins with a comprehensive sewer camera inspection. A micro camera is inserted into the sewer lines to provide a clear visual picture of what’s happening inside your sewer system. Our technicians will know what the cause of the problem is, where it’s located and what kind of trenchless repair needs to be done in order to fix it. At Lining & Coating Solutions, we know that each plumbing issue is unique and should be addressed as such. Our technicians are trained to handle everything from residential piping issues to industrial plumbing emergencies. More often than not, it’s the usual wear and tear that causes sewer line issues. Tree roots, poor construction materials, corrosion and shifting foundations can also cause serious sewer problems. Pipe lining is an innovative process that repairs the broken pipe instead of needing to have it replaced. 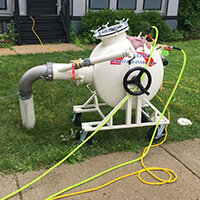 A thorough hydro jetting procedure clears out the insides of your pipes, eliminating debris and calcified material stuck to the inner diameter. A resin-coated felt tube is then inserted and held into place, then inflated using an artificial bladder. In just a few hours, the resin hardens and assumes the shape of the inner pipe circumference, effectively creating a new pipe within the old sewer structure. The new material bonds to almost all kinds of piping material, i.e., clay, corrugated, cast iron, Orangeburg, PVC, cement, etc. You’ll have a new pipe that will last for 50 years and will protect your sewer line from both exfiltration and infiltration. Our technicians can also do pipe cutting as part of the trenchless repair to ensure a one-step solution. The broken section of the pipe is removed without damaging the lining. Sewer pipes may collapse and become damaged beyond repair; in these instances, it will be better to perform a pipe bursting process to set a new pipe in place. Entire sewer lines can be replaced this way. Our technicians prepare two access points, then lead a bursting head through the inner pipe, destroying the old pipe and scattering the materials into the surrounding soil. You get a durable, jointless pipe that’s less prone to common piping issues such as calcification, matter buildup, root intrusion, etc. Trenchless technology carries many benefits as compared to traditional methods of repair. You’ll need fewer men, less digging equipment, fewer labor hours, and you’ll get to save more money in the end. Pipe lining is now more affordable than ever, thanks to today’s technology, making it a wise investment for your home or your business.